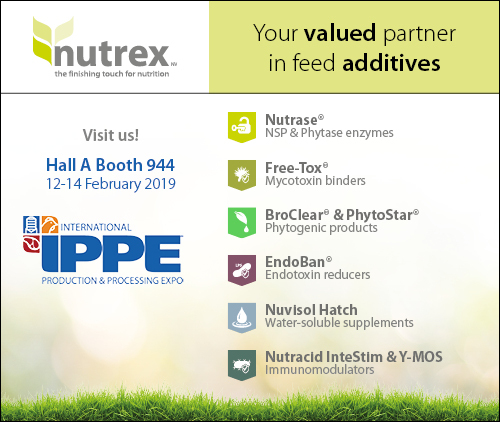 Nutrex, a leading global supplier of top quality feed additives, will be present again at the 2019 International Production & Processing, IPPE, in Atlanta, Ga. USA, from February 12-14, Hall A booth 944. During this event, Nutrex will be presenting Endoban, a feed additive to reduce endotoxins in multiple species. At the International Poultry Scientific Forum in IPPE, Nutrex also will give the presentation The effect of a feed additive (EndoBan) on broiler performance on Tuesday 12.